* Audio Tracks contains seven songs from the series. written & composed by Ralph McTell. written & composed by Tommy Sands. performed by Cara Dillon, Sam Lakeman on Piano. Steve Larkin & Damian Gallagher. Vocals by Billy Connolly. Trad. 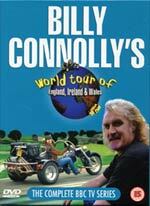 arranged by Billy Connolly. Vocals by Billy Connolly.